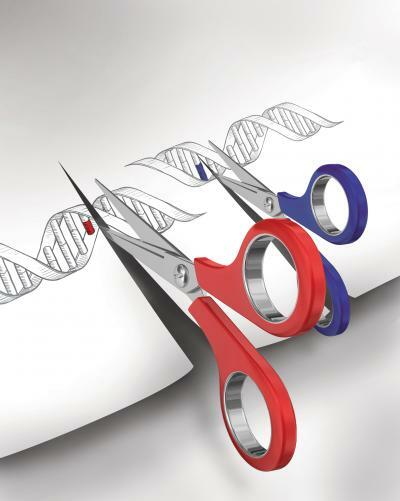 The genome editing craze can hardly be contained. Seemingly with every passing day some new breakthrough is reported, designed to make genome editing faster, cheaper, and more accurate. At the center of this revolution is the CRISPR-Cas9 system, which has already been used to modify gene sequences among an array of organisms. Initially, the CRISPR system took advantage of the Cas9 enzyme, a naturally occurring protein in the immune system of certain bacteria, which acts like a pair of molecular scissors to precisely cut or edit specific sections of DNA. However, scientists have recently begun to manipulate CRISPR-Cas9 variants as gene regulation tools, in order to reversibly turn genes on or off. Both the gene editing and gene regulation processes start with the same step, which is the recruitment of Cas9 to the genes of interest by a matching sequence comprised of guide RNA, which aids the Cas9 attachment onto the DNA sequence. Yet, until now, investigators required the use of two variants of the Cas9 protein to perform either the gene editing or the gene regulation steps. Currently, researchers from Harvard University and The Massachusetts Institute of Technology have developed a new approach that will allow researchers to achieve both tasks using a single Cas9 isoform. The Harvard/MIT team found that the length of the guide RNA sequence played a critical role in determining the fate of Cas9—whether it would solely bind to DNA or if it would excise it as well. “We decided to systematically test why it was that truncating the guides too much caused Cas9 to no longer cut the intended genomic site,” stated Alejandro Chavez, Ph.D., postdoctoral fellow at Harvard’s Wyss Institute for Biologically Inspired Engineering. The researchers found that shorter guide RNAs prevented Cas9 from cleaving the target gene, but not from efficiently binding to the target. This finding could open up the possibility for scientists to attach gene regulation proteins to Cas9 for delivery to specific genes. “This new functionality will improve our ability to decipher the complex relationships between interdependent genes responsible for many diseases,” noted Marcelle Tuttle, Ph.D., research fellow at the Wyss Institute and co-author on the current study. The investigators were excited by their findings and believe that this new method could also be used in large-scale metabolic production of chemicals and fuels using genetically engineered bacteria, while simultaneously safeguarding the microbial biofactories from infection by foreign pathogens.